We originally met at school around 18 years ago but a 2 year age gap seems such a big thing at that age. We have groups of mutual friends through school and connected again years later through the wonderful world of social media! How did you know Brian was the one for you? Brian came into my life again during a really difficult time whilst my mum was terminally ill. She passed away only 4 months later and I was keen to shield Brian from it all. I was insistent he got on with his life; however he seemed to stay and patiently built me back together. I will forever be indebted for that; happiness crept in a door I didn’t think was open. How did you know Voni was the one for you? I knew Voni was the one for many reasons. Top of the list is her caring and selfless nature; it is instinctive for her to care for everything regardless of circumstance. And another important factor is Voni’s tolerance and compromise. She is very organised and tidy, whereas I am not! How did Brian propose to you? We went away to Newquay for the weekend to The Board Masters festival in August 2015, the weather was beautiful. On the Saturday morning after the festival night we attended, we went down to Tolcarne Beach which is a relatively small cove. He proposed unexpectedly on the beach (so unexpectedly in fact, I was stuffing my face with crisps at the time, resulting in hardly desirable crumby fingers to receive such a beautiful ring). Why did you decide to propose this way? I wanted a low key and relaxed setting because neither of us like too much fuss or attention. I was a personal moment between us whilst in a beautiful location. How long were you engaged for before you tied the knot? 26 months. 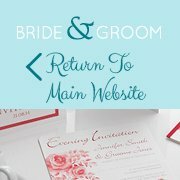 We set a wedding date in advance in order to provide notice for everyone but also to be able to save hard and pay for the wedding ourselves. 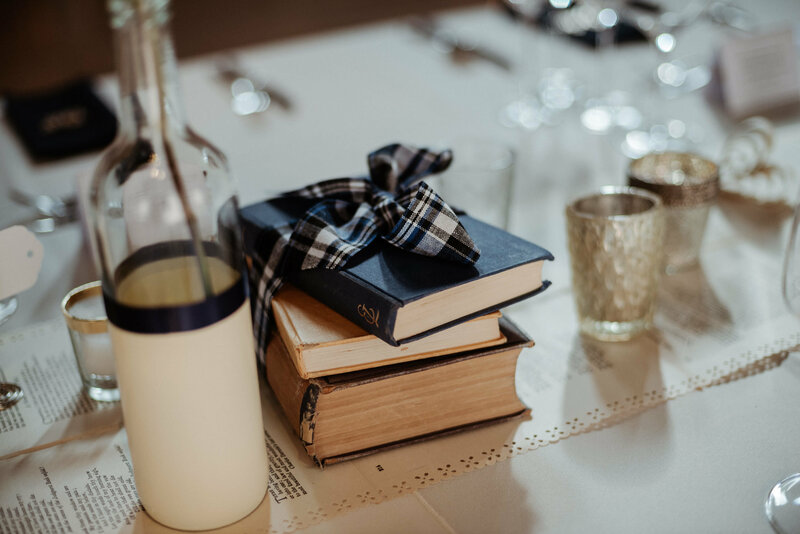 Were there any family traditions that you wanted to incorporate into your wedding? Both of our families have strong Scottish connections, most are based within Scotland and my mother is buried there, so we always knew we wanted to get married in Scotland. 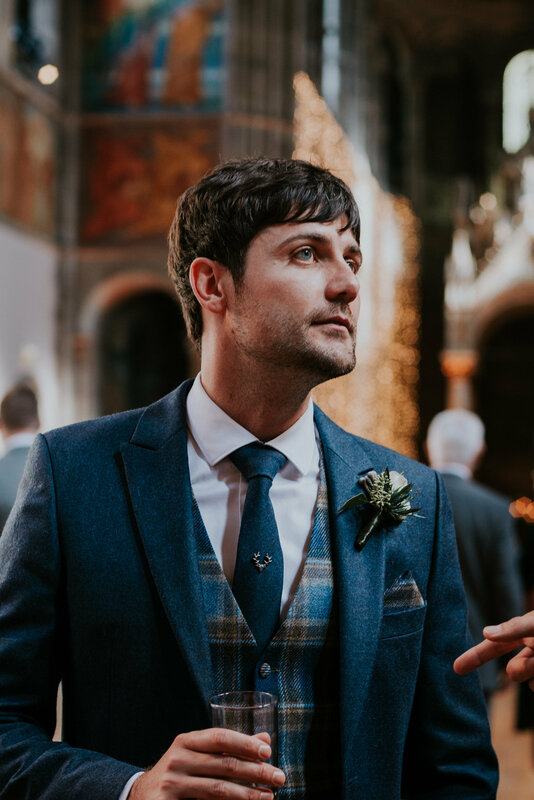 The suits we picked touched upon this and although the details for the suits were tweed, the pattern also looked tartan which was a nice balance of both English and Scottish detail. Our flowers naturally included thistles; we had a piper and a ceilidh of course. Brian’s tie pin was a stag and we gave stag tie bars as gifts to our male friends and family. We hand wrote funny Scottish dialect quotes and definitions such as ‘braw’, ‘blether’, ‘pished’, ‘steamin’, ‘bawheid’ and ‘wheest’ on tags and put them in the toilets and on the bar! My grandmother is Irish and traditionally an Irish Gaelic speaker, as are other family members. We had an Irish blessing read in Gaelic by one of our family members which was a wonderful touch. We also incorporated some old traditions into our ceremony such as hand fasting, where the term ‘tying the knot’ comes from and ring warming where our rings were passed around all guests to give thoughts and wishes, acknowledging our marriage will encompass support from those individuals. As my mother had passed away 5 years previous, I had a photo charm on my bouquet and we worked closely with the local hospice she was cared for in to create charity favours. It was the perfect way to make favours more personal, whilst raising money for a charity close to my heart. Similarly we worked closely with the company compiling and designing our invites and table plan which matched another charity donation to Macmillan. We made a notice board with photos of loved ones passed, left empty seats during the ceremony with red roses on that would have been for them and lit candles during the ceremony itself. This was additionally poignant as we sadly lost Brian’s grandmother unexpectedly 5 weeks before the wedding. Did you have any help when you were planning your day? Because we finalised our wedding date 21 months in advance, it felt like I had plenty of time to plan although the time did go very quickly. 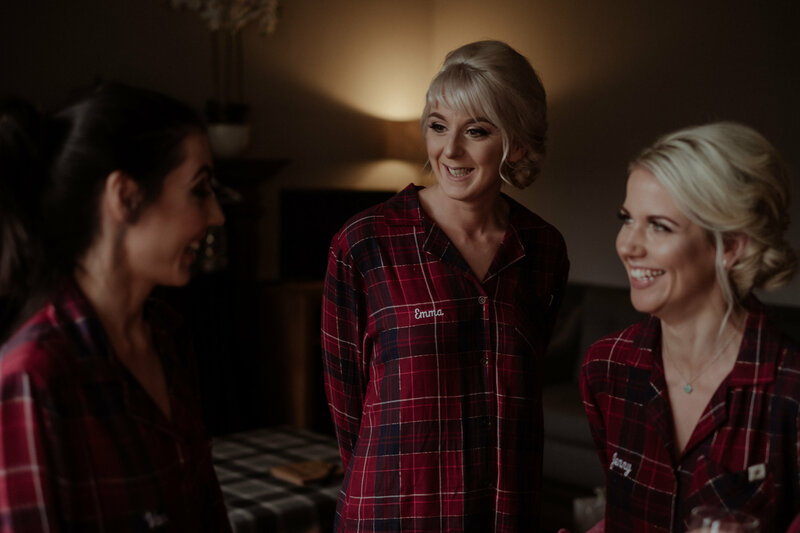 I undertook most of the organisation myself and had lots of offers of help but was keen to keep the day as a surprise to ensure our guests had a wonderful time. A lot of the detail was with them in mind. Brian’s family and his parents were so supportive and keen to support us in any way. We received such generosity both physically and emotionally upon getting engaged from everyone on both sides of the family. As Brian’s mother had just retired, we were insistent on providing everything for the wedding ourselves. However, finally we accepted their exceedingly kind gesture of helping us with the venue deposit, especially as we paid it 2 weeks before Christmas 2015! Brian’s mother made us the most amazing fruit cake as an alternative to the sponge we had as our main cake. Everyone commented it was the most delicious one they had had, me included considering I don’t even like it. 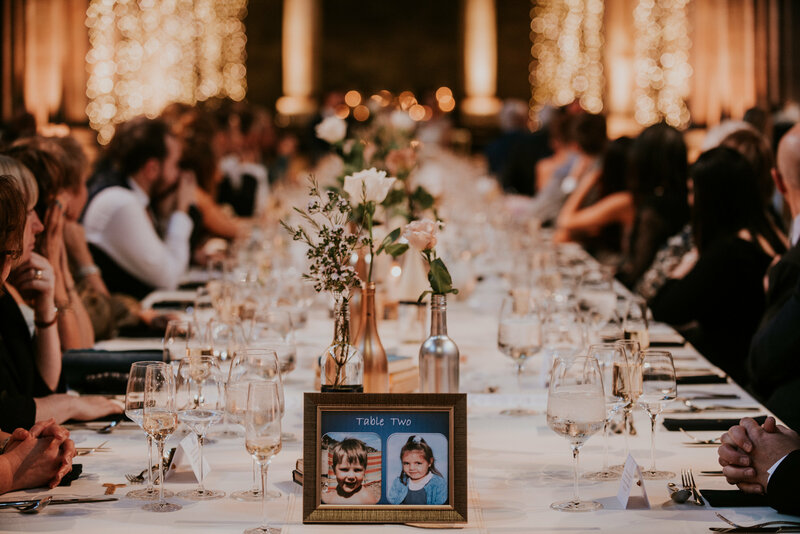 My sister Leona was amazing in helping us design and print all of our stationary needed on the day such as orders of service and menus, our photo table numbers and generally helping with the necessary ‘what do you think of this’ kind of questions. 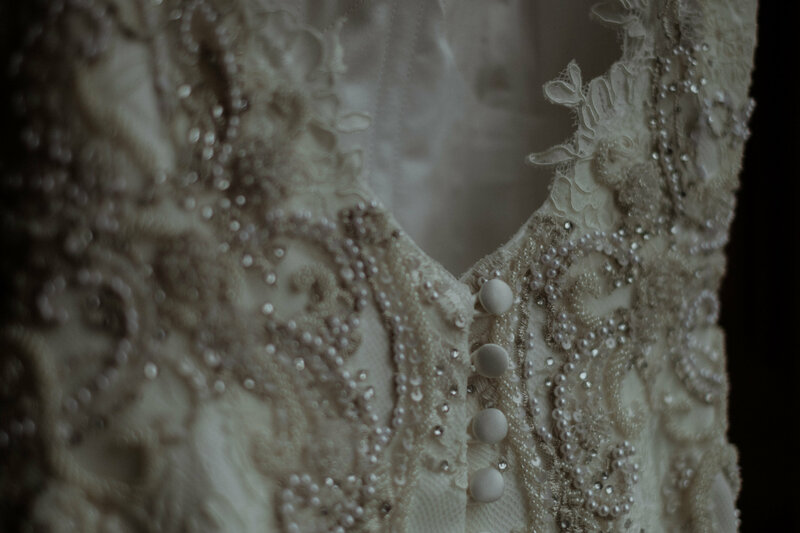 She generously gave me my deposit for my wedding dress which was very kind and will always be remembered, especially as I had asked her to give me away. 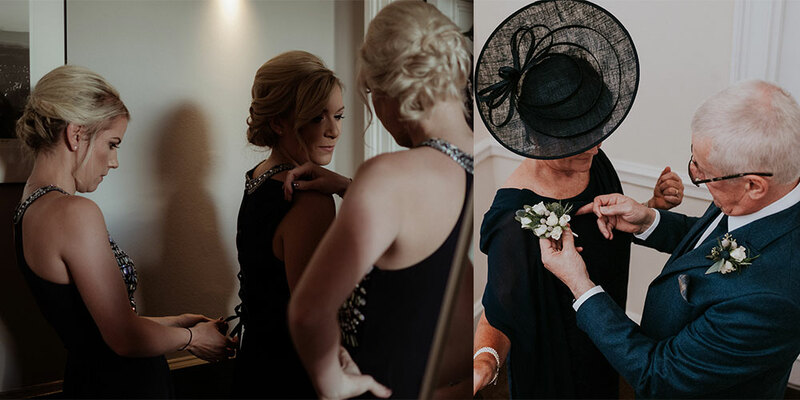 As a thank you, I was keen to provide everything she needed for the wedding, from her outfit to makeup. My sister in law Joanne and her husband Paul made us the most amazing wooden photo booth polaroid frames which offered a lot of fun. 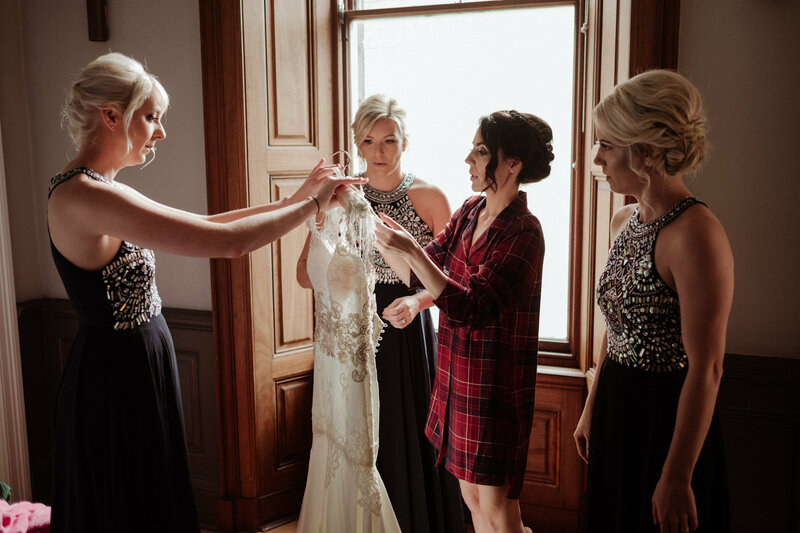 Additionally, Joanne is a talented seamstress so was the perfect person to help with dress alterations for a bridesmaid whom became pregnant. Joanne is just such a reassuring presence in everything she does which was invaluable should there have been any nerves. My cousins Patsy and Emma kindly gifted us our wedding cake to which we will also be indebted. It was very touching, absolutely stunning and a really big help to receive. We travelled back and forth from England to Scotland many times within the planning process to which Emma always put us up which also helped us so much. Our friends Charlene and Lee gave us some left overs from their wedding such as their sweetie bar jars and photo booth props. It is literally a case of begging, stealing and borrowing whatever you can when it comes to weddings! Our bridal party, particularly my three bridesmaids Jenny, Jess and Emma were always offering to help. All I needed was for them to be there, which they were and completely the right people to have by my side. 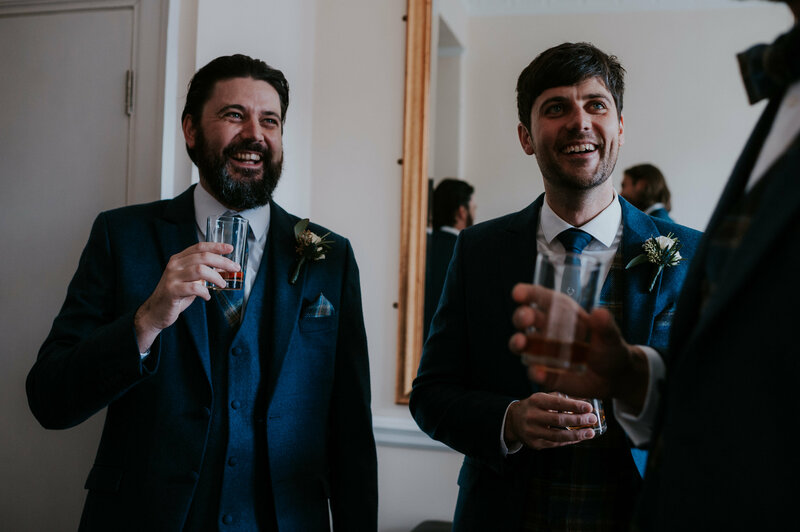 Best man Mark and Usher Richard were there to basically drink whisky and entertain people, which they excelled in! How did you decide on a venue? 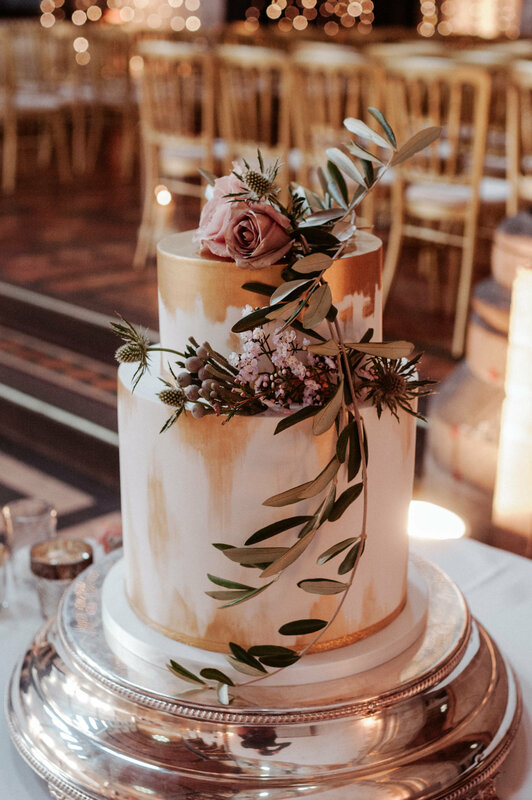 We had done some research about wedding venues in Edinburgh and had considered going further afield as we just didn’t get that ‘this is the one’ sort of vibe. I was reluctant to go too far, feeling concerned about the amount of people travelling and any additional inconvenience. After some digging I found our venue and I liked that it isn’t exclusively listed for weddings. I very much like art, history, culture and we were both brought up Catholic which ticked numerous boxes. I liked the multi purpose approach of it, that it is used for various things such as hosting Question Time on occasion. On the day we arranged to view it, there was a wedding starting within 90 minutes. Whilst the place is absolutely stunning, it was the relaxed and organised atmosphere that sold it to us. There was no sense of pressure and it was very relaxed even in the midst of preparing that day’s wedding. This translated itself throughout planning; everything was so flexible which was really helpful when we were based over 4 hours away. We certainly were not disappointed on the day when the venue staff delivered the experience with absolute military precision. Huge thanks go to Bryony for her patience with my early days 10 million questions, Jacqueline for just everything and Marites for her impressive drill on the day. We were touched to receive an unexpected gift following the wedding of a sketch of the venue. Customer service and personalisation was just amazing. How did you decide on the wedding style? 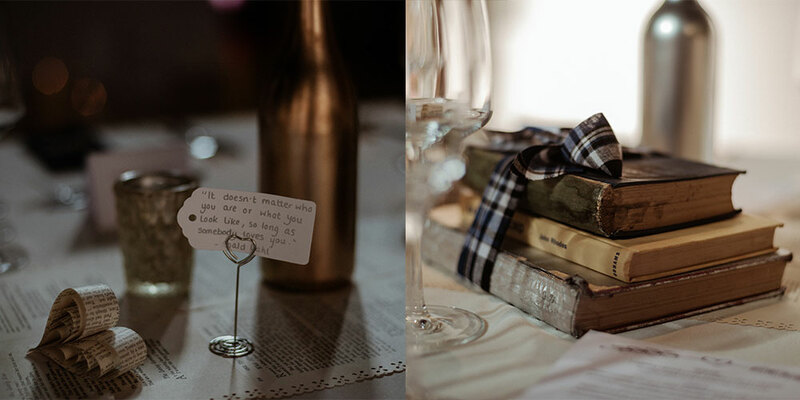 We both have a reserved, understated style and the venue requires little decoration. Therefore we knew we did not want anything too bold or imposing. My dress was inspired by vintage 1920s so the neutral and pastel colouring in the flowers complemented this. Autumn is my favourite time of year which influenced the use of metallics and lots of candles for decor. I was keen to DIY as many things as I could, partially as I do enjoy getting creative. In terms of the overall style, this was based upon literature, with a book page runner, book piles and quote tags incorporated every where. It was amazing to see it all come together considering we made everything ourselves and an added bonus it was a very cost effective way to style tables sitting 36 people on each! 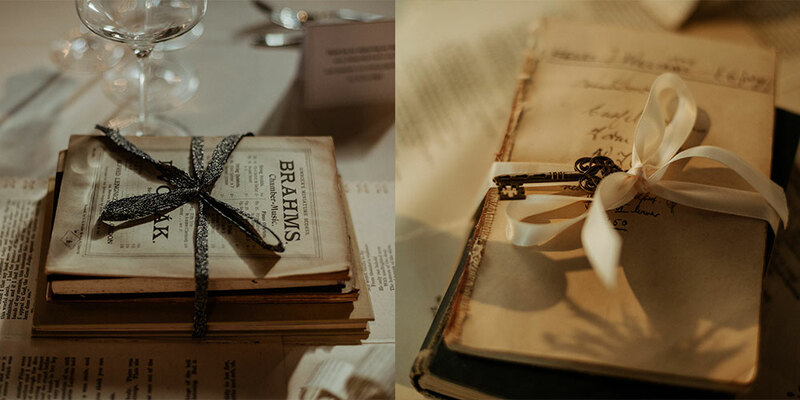 Who would have known used wine bottles, spray paint and old shabby books would have looked so romantic. How did you keep track of your budget? We used a free, downloadable spread sheet that automatically had categories and facility to balance cost and saving which was very helpful. We also had numerous spread sheets of our own and a separate bank account just for wedding expenditure. Aiming to spend less on each category in any way is a beneficial mindset to keeping on track. Did you find it difficult to stay in budget? Overall no but generally there are things that are expensive no matter how resourceful you aim to be. It is the cliché regarding the word ‘wedding’ which appears to influence prices of things. We initially underestimated our flowers but overestimated our photographer, therefore things balance at times. It certainly is hard to allocate fractions of the budget to certain things when unaware of what the generalised cost is but it is important to do research and prioritise. We generally live within our means and are not generally flamboyant individuals. 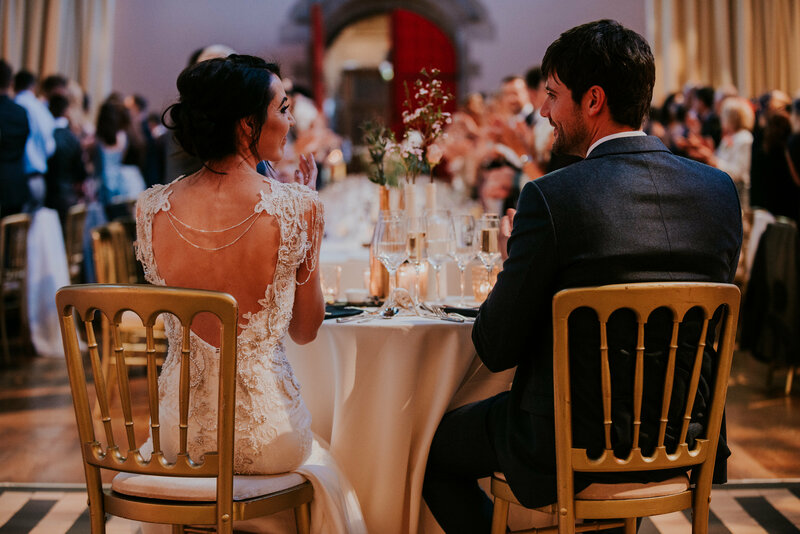 We certainly maximised getting married out of peak season (and it’s my favourite time of year – perfect! ), shopping around, haggling, using discounts, DIY’ing things, accessing favours and have found that most people and companies are usually happy to help. Additionally, I didn’t feel that anything of mine should come out of the wedding budget, therefore paid for my dress, shoes, all hair and myself. If you have one tip to give to couples planning their wedding budget what would it be? Try not to be too emotional over decisions because it is so true that all of those details are just for one day, even though it is such a special time. Weddings can be as individual as you like and achieved on any kind of budget. Our marriage application cost £70, that is probably one of the most important things and it refocuses that the true cost of marriage is completely attainable. Keep grounded, realistic and retain the real meaning. We felt getting married was our choice and we did not expect and declined help. We decided what type of day we wanted, therefore was responsible for footing the bill for it and chose to try contribute ethically as well. Were there any hidden costs you hadn’t initially planned that cropped up? In Scotland VAT was not automatically included in each costing, therefore seeing a price could be misleading. Where bulked together, psychologically paying a big VAT bill felt like wasted money. Therefore we specifically requested all prices included VAT to avoid this feeling and know exactly what we were doing. 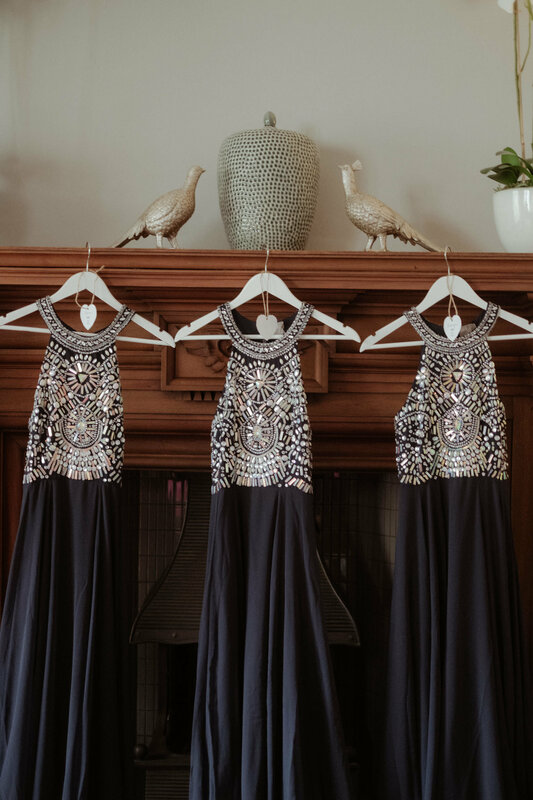 How did you know your dress was the one for you? I knew straight away I was not the type of individual to go dress shopping, trying on various dresses and being showered with focus, styles, details and information. I just knew I wanted to visit a local specialist dress maker despite not trying anything on. Initially it felt like a gamble but I just knew it was the right decision for me and I had an innate trust in her immediately. 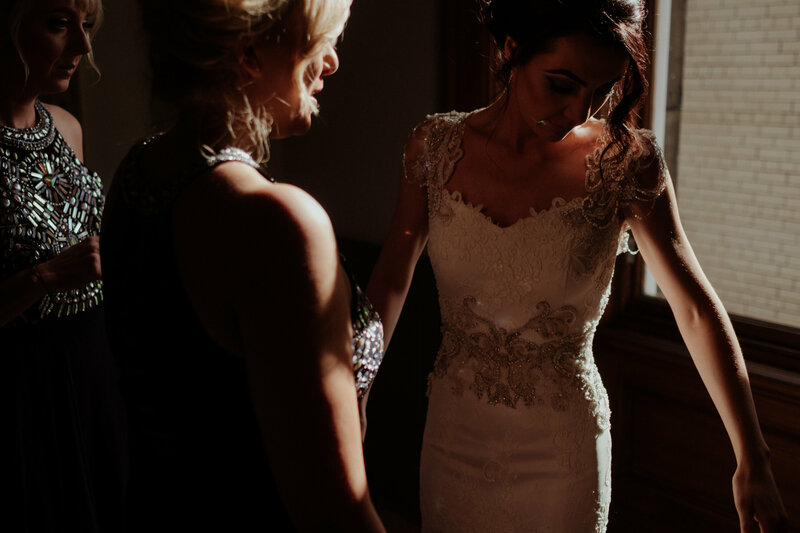 The process was absolutely amazing and I could not have been happier with my dress. I was struggling with finding the right veil to go with my dress and was absolutely touched to have had a bespoke veil made alongside my dress as a gift, which matched perfectly. How many dresses did you try on? How many dresses did you try on? 0! Did you decide on a ‘traditional’ wedding dress style? If not, why did you choose this? Whilst I chose a traditional style in terms of length, shape and shade, I was keen to have a modern take on a 1920s style. 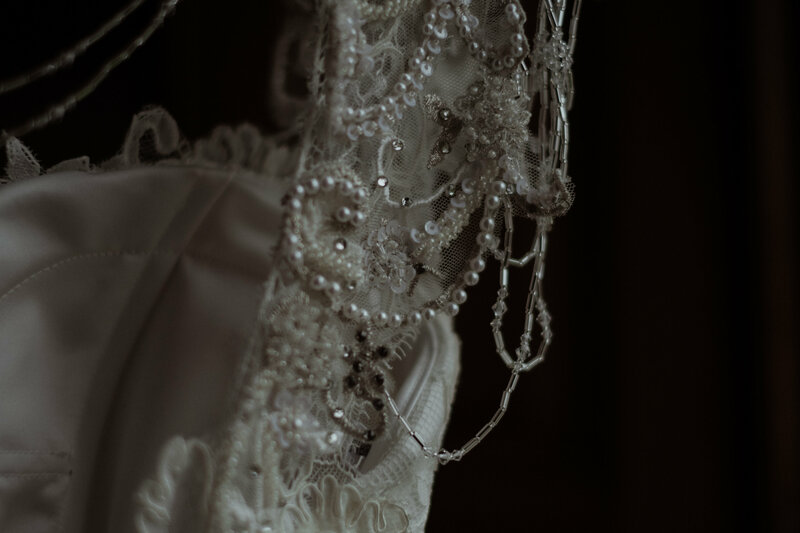 Whilst it was typically a wedding dress, I felt the detail I had was somewhat unusual. It was perfect for me and it was captured beautifully. Whilst I have an understated and moderately feminine style, I also like things that are slightly different, gentle and unique. 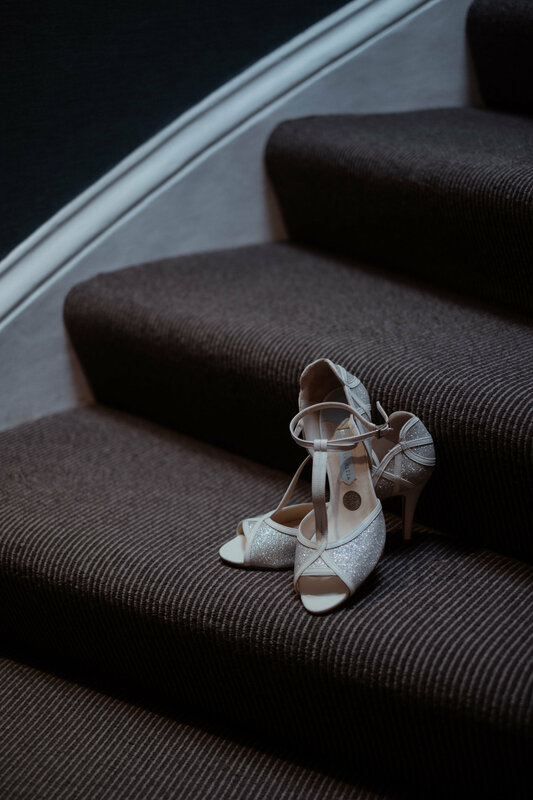 What’s your top tip for a bride trying to find the perfect dress? Trust your gut instinct. I personally felt it was helpful going to dress appointments alone or with very few people. My bridesmaids and Brian’s mother didn’t see my dress until my final fitting and my sister did not see it until the day. It was a lovely experience and helped me stay focused. 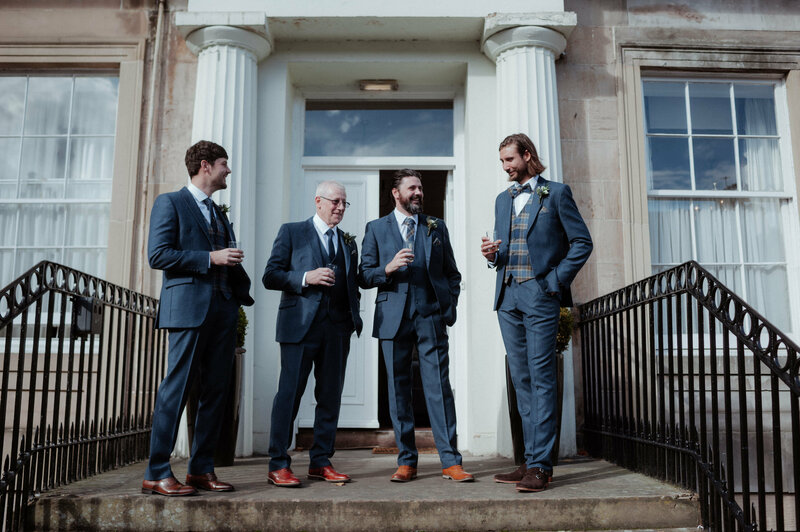 Did you decide on a ‘traditional’ suit style? If not, why did you choose this? Brian also didn’t try on any suits other than the ones we had seen and determined we wanted to prioritise before making any other decisions. Visually they suited the style and shade we wanted but also turned out to be extremely good quality and stylish. What was the most stressful part of planning your wedding? It was really sad that unfortunately a few guests could not make it within days of the wedding due to travel arrangements and illness. It is sad knowing you won’t see them but also how best to problem solve their empty place and being resourceful with any left overs at that stage. I can’t say that I ever particularly felt stressed with anything until we set off to Scotland at 4am on the day before the wedding with Brian’s VW camper van full to the brim, I was certain I would have forgotten something major. Were you nervous on the day? How did you overcome this? Surprisingly I wasn’t. I think it’s because there is so much going on and I automatically retorted to ‘host’ mode in the morning, co-ordinating necessary plans and making breakfast for everyone. I really enjoyed seeing everyone be beautified. Addionally, having 10 minutes on my own in the apartment once everyone had left, the bridesmaids were travelling to the venue and my sister was downstairs waiting for our vehicle was really valuable. There is no time to have a moment to yourself and gather composure, taking it all in. I think I had also accepted the fact that there was now no more I could worry about, all our planning for almost 2 years was going to become known and there was nothing I could do except embrace and enjoy it. What was the best part of the day for each of you? Voni: Once the ceremony was over, the venue purposefully closed the doors so you are separated from your guests and are offered a drink. It was just a moment to be together to ‘realise’ you are husband and wife, privately acknowledging one another how you couldn’t upon meeting at the alter. Also, It was absolutely wonderful seeing everyone having fun at the ceilidh, many having never been to one before and learning the group dances. Brian: We deliberately decided to sit on our own rather than having a top table, overlooking all of our guests. It was a moment to see them all enjoying themselves and that they were here to celebrate with us. And the food was amazing! Is there anything that you wish you had known when you were planning your wedding? To be more prepared for others not being mindful of time scales as you. Where providing lots of notice, deadlines creep upon people without realising and chasing things can occur. Lots of things end up feeling like they are out of your hands and you are actually uncertain how everything is going to come together on the day. Do you have any tips on life after the wedding? Has it been difficult to adjust back to ‘normal’ life, where you don’t need to spend all your time planning? I think due to having so long to plan, I didn’t feel absolutely consumed with wedding arrangements. It felt manageable especially where we ensured all the major things were booked well in advance. We still haven’t booked a honeymoon and I think that has helped with not experiencing ‘wedding blues’. We still have something to look forward to as we will eventually book one and with being in Edinburgh for the wedding, it was like a city break. Just embrace having more free time and importantly, spare money! If you could go back and give yourself three pieces of advice what would they be? Spend more time really thinking about any group photos you may want from your photographer. Our photographer was absolutely amazing and we provided lists of people for traditional group shots. It’s a difficult task (like hearding cats to be precise!) but I wish I had thought more closely about it. The day goes fast and I’ve reflected I would have liked a photo of me with my grandmother and more of me and my sister and bridesmaids for example. Whilst it is useful to be prepared and organised, upon reflection I bought things too early that I ended up changing my mind about and should have waited really. One example was buying a beautiful art deco hair comb before my dress was finished, which I actually didn’t need. It’s a shame to feel things are wasted and is in fact not best use of money resources. Looking back on the whole experience, is there anything that you wish you worried about less? Ensuring that everyone had a good time. Ultimately every wedding is a wonderful experience and such good fun.